I’m one of those people who drink my weight on. I’m not talking about boozing it up with the ladies on the weekend. I’m talking about soda with lunch and dinner. It’s bad, but I won’t switch to diet because I’m afraid of all the chemicals. 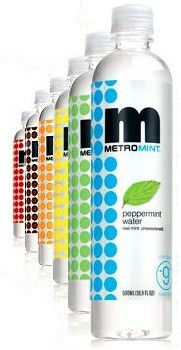 Metromint water is a nice alternative for those meals when I want a little extra taste but am not looking for the extra calories. The brand has several flavors to choose from – chocolate-mint being my husband’s favorite. Me? I’m more of a cherry-mint kinda gal. Check out the ingredient list: purified water, mint, cherry essence. Have you tried Metromint yet? There’s no sugar added so it’s definitely worth a try!